Apple has partnered with Code.org to offer free Hour of Code sessions for kids at all of its stores. 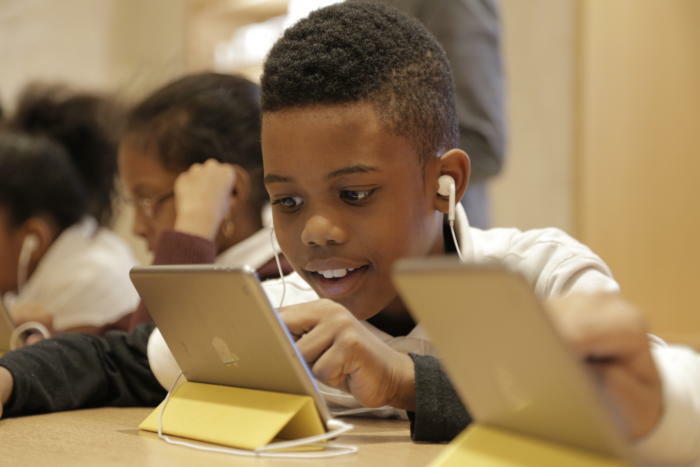 This year, Apple embarked on a mission to help teach kids how to code, so it developed Swift Playgrounds to make it fun, even for grown-ups. Now, Apple is bringing the fun to its stores. Apple has partnered with Code.org to offer in-store, hour-long coding sessions at all 487 retail locations around the world. The weeklong initiative is inspired by Code.org’s Hour of Code online tutorials, and launched on Monday to coincide with Computer Science Education Week. 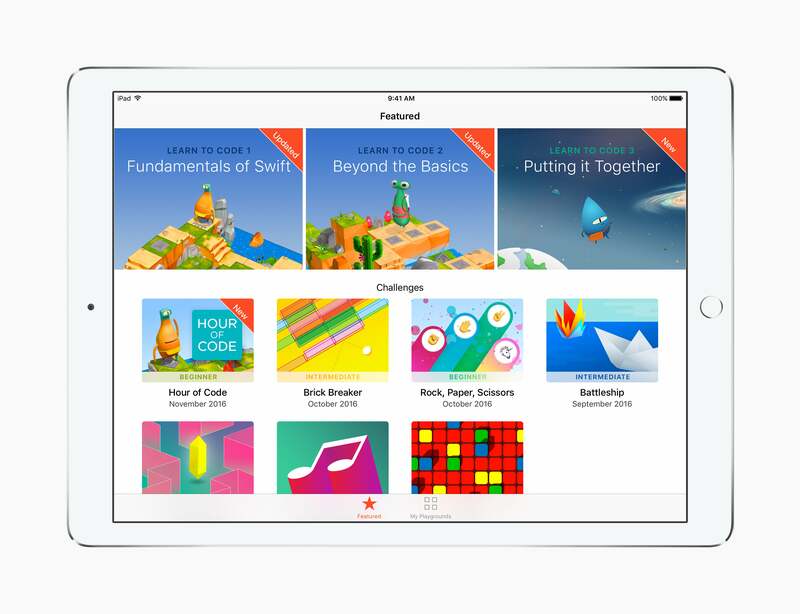 In addition to Code.org’s Block sessions, Apple store employees will also be guiding kids on how to start using Swift Playgrounds (free in iTunes), its learn-to-code app for iPad that launched with iOS 10. Macworld's executive editor called Swift Playgrounds a “triumph”, so I stopped by the Apple store in Union Square to see if the kids agreed. This was Daniel’s first time using Swift Playgrounds, but he has been learning to code since he was 5. First, he started taking tutorials on Khan Academy, the non-profit online education service, and then at Microsoft’s in-store YouthSpark summer sessions, which are akin to Apple Camp. Daniel’s dad, Jose, decided to sign up for Apple’s Hour of Code session to get his son more interested in their family’s Apple products at home. Currently, Daniel likes to code using Adobe’s Dreamweaver on a PC. “I didn’t know that there was something to teach him how to code for Apple, as well,” Jose said, hoping that Swift Playgrounds will get Daniel to spend more time using their family’s iPad. Even though Daniel seemed to think Swift Playgrounds was “easy,” he’d still get visibly excited whenever he completed an early level, the ones designed for beginners. That’s the genius behind Playgrounds: It combines puzzle-like moments of delight that resonate with kids while offering valuable lessons regardless of your familiarity with coding. If you can't make it to the Apple Store, there's even a new Hour of Code challenge inside the Swift Playgrounds app. In fact, a few people at Apple’s in-store Hour of Code were much older than the intended 8-12 age range. These twenty-something beginners certainly learned during their Hour of Code session because Swift Playgrounds works for them, too. Like a good puzzle game, there is no learning curve and it gets more complicated as you go along. Daniel said he was up to the challenge, and that he sees himself continuing to use Swift Playgrounds at home. Naturally, Daniel wants to be a developer when he grows up. Kids trying out Swift Playgrounds at the Apple flagship store in Union Square, San Francisco. 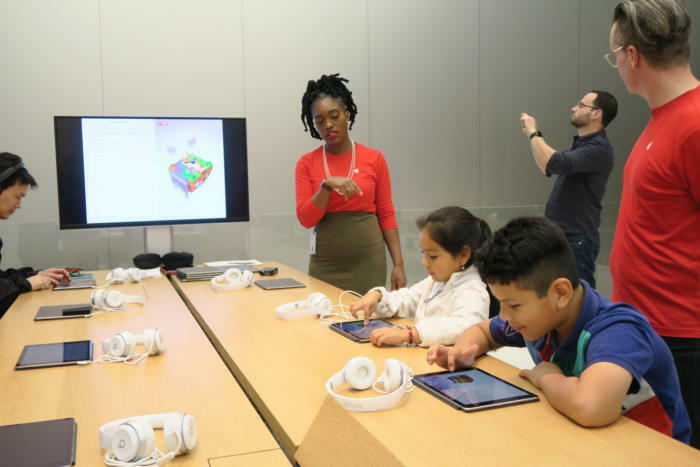 Every Apple store will be hosting Hour of Code sessions until Sunday, December 11, but you need to pre-register online. You can check here if there’s availability at your local Apple store. 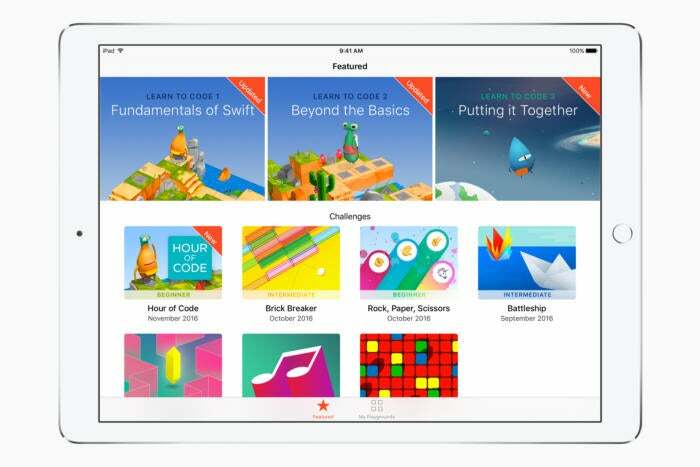 You can also install Swift Playgrounds on your iPad—now with new Hour of Code challenges—and start your self-taught journey into learning to code in Swift.